SMi’s global panel of speakers will strengthen your knowledge in key topics such as high potent ingredients, ADC payloads, PK-PD technological advancements, warheads and site selectivity, immune-oncological combination therapies and fragment drug conjugates. Pfizer is using its understanding of the biology of cancer to explore a number of antibody-linker-cytotoxin combinations and build proprietary ADC platforms, to develop a diverse ADC toolkit. Hear more from Pfizer in an opening key note address on new advancements in next-generation ADC development when SMi welcome the expertise of Alison Betts, ADC Scientist next April. 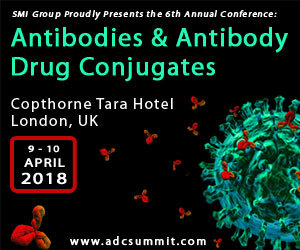 With a focus on modelling and simulation, Alison will provide attendees with exclusive insight sorrounding key developments in Kadcyla, a HER-2 ADC approved in 2013; PK/PD methodologies for efficacy and safety differentiation; and a proposed mechanistic target mediated drug disposition model.